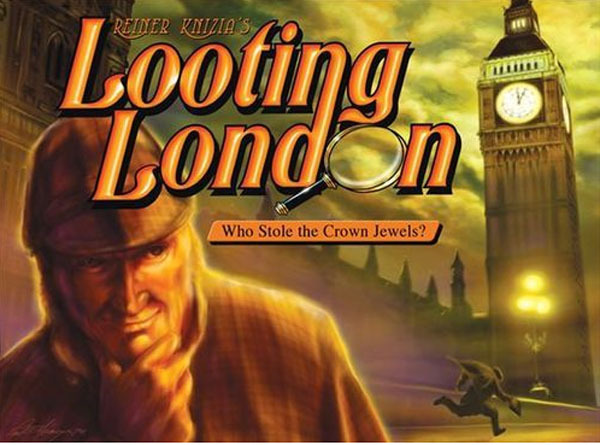 Looting London is a game that seems so simple you might think it doesn’t have much to offer as a game when the rules are explained; however, it contains a simple but clever little filler game. This is not too surprising when you know the game is designed by Renier Knizia and this game is quite typical of his designs. The players are investigating the theft of London’s 5 biggest treasures (although the theme is inconsequential in this game). The goal is to score as many victory points (VPs) which are scored by collecting tiles. The game consists of various tiles and cards. Each tile is one of 5 colours (each matching a treasure) and has a number between 1 to 5 and a character (boy, detective, policeman and lady) on it.